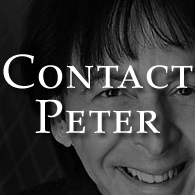 written by founding band member, Peter Criss! I wish you all a very Merry Christmas. Be safe and enjoy your loved ones. Happy 70th Birthday, Peter Criss! Happy birthday, Peter. You should be so proud of your life. You have brought so much joy, wonderful memories, and have inspired so many people to create music . I love you so much my wonderful husband. Not many men can say they have achieved their dreams. You have surpassed yours and have touched so many lives. God has truly blessed you and in turn you have blessed so many. Thank you KISS fans for all the love and support you have given Peter all these years. It means the world to him. I pray we have many more years to share together! On behalf of all the fans around the world we would like to wish a very happy 70th birthday to the one and only Catman, Peter Criss! 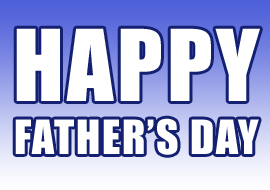 We hope you have a wonderful day and many, many more to come! It has been 35 years since John Lennon was assassinated. His music changed the world and changed my life, as well as many others. As our world is still in trouble, to quote the great John Lennon, "All You Need is Love." remember all the men and women who gave their lives for our freedom. Our love and respect go out to the family, friends, and fans of Scott Weiland. Scott was a great showman and artist and will be missed. Today we celebrate the life of the great Eric Carr. Our thoughts and prayers are with his family as we remember the great man, friend, and musician that will always be in our hearts. To the people of Paris, France, our prayers are with all of you after todays horrible events. Thank you to the brave men and women who have served our country so that we can enjoy our freedoms. Your service and sacrifice is forever appreciated and your courage will never be forgotten. We love you! I want to wish my wife Gigi a Happy Birthday. She is my best friend in life. I would be lost without her. She does so much for me and others, never thinking of herself. That's what makes Gigi a winner and I love her to death. Happy Birthday, Gigi. Have a wonderful day! Shout out to Connor Phelps, this years recipient of the Peter Criss Man of Courage Award. We wanted you to know that The Catman is on your side. We are fighting this fight with you. Love, support, and prayers to you and your family. Please visit our new shop page to purchase authentic autographed Peter Criss items. We currently have photos, books, posters, and drum heads hand signed by The Catman himself! Congratulations to our friend, Bridget Asbury, on the release of her new childrens book series, Turtle Tree Shoolhouse! The books are written by Bridget and illustrated by her husband (and our webmaster), Ralph Asbury!! We wish you all the best!! Thank you to everyone who came out to DW Day at Guitar Center in NYC. It was a great event and it was a pleasure to come out see you guys. Thank you to DW's John Good, Modern Drummer's Billy Amendola, Roger Earl, Billy Ward, and everyone at Guitar Center. It was great to see you guys! 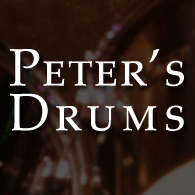 Founding KISS drummer, Peter Criss, will be appearing at Guitar Center Union Square in New York City on October 3, 2015 as a special guest for the DW Day 2015 event held by DW Drums! Come on out and see The Catman! 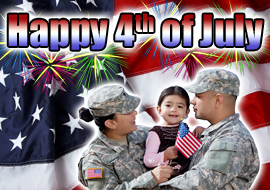 Have a happy and safe Independence Day! Celebrate the independence of the greatest country in the world as well as the men and women of the armed forces who put it all on the line for us!! Thank you to each and every one of you! 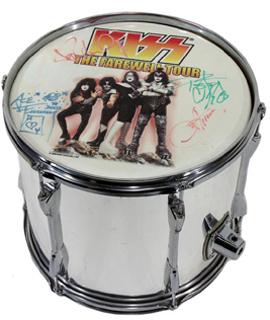 This drum was originally listed on the site as having been played by Peter Criss as a practice drum during the Farewell Tour, which is not true. The listing has since been updated, but we want to make very clear that Peter Criss never owned this drum, nor did he ever play this drum, nor did he ever give this drum to a crew member. Peter is a DW drummer, and this is a Yamaha drum. This drum was not attached to KISS or Peter Criss in any way on the tour. Thank you to all the fans who are willing to spend their hard earned money to have a piece of Peter's history in their collections. We will do anything we can to make sure that you get what you pay for and do not get ripped off!! Happy Birthday to our friend and webmaster, Ralph Asbury! Thank you so much for everything you do for us with the website and otherwise. We appreciate all your help and we are happy to have you as part of our family! We love you! 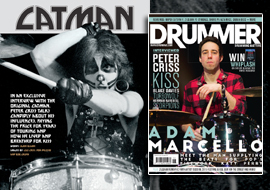 The new issue of Drummer Magazine, featuring a brand new interview with Peter Criss, is now available! We hope you all pick up a copy as a keepsake because the interview is not available online! 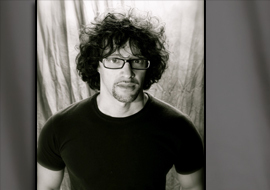 Special thank you to Bob Gruen and Len DeLessio for providing their great photos!! 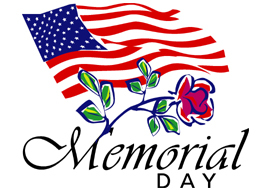 Have a happy and safe Memorial Day weekend as we remember the great servicemen and women who gave their lives for us. We are very sad to hear about the passing of BB King. If ever there was a king of the blues, it was BB King. He has had unequaled influence on music and musicians. His music has inspired its many listeners, and his playing has inspired and molded many careers. Our thoughts and prayers go out to his family, friends, and his many many fans around the world. We are happy to announce that the June 2015 issue of Drummer Magazine will include a great feature on the one and only Peter Criss! Make sure you stop by your local newsstand or bookstore and pick up your copy! This will be one of the longest features on a drummer that the magazine has ever done! Thank you to everyone who came out to see me at the Mad Monster Party! Thank you to Eben and his amazing staff and volunteers for making us feel welcome, as always! Thank you to Danny Stanton for traveling with us and helping make this another great event! 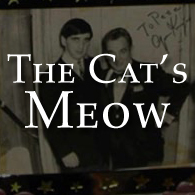 May 3rd, 2015 marks the 17th Wedding Anniversary of Peter and Gigi Criss! The current issue (May 2015) of Living in Monmouth County magazine features a cover story on The Catman, Peter Criss! Inside the magazine is a great interview with Peter. Happy Birthday to the one and only Spaceman! 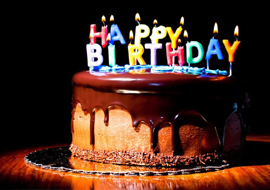 All the best and many more to come!! Last year I attended Mad Monster in Charlotte, NC. One of the fans that came out to visit with me was a man named Rick Adkins. He is a KISS fan, but more importantly, he is a father. He told me about his son, Trevor, who was in the Army, and was killed in Iraq. I was heartbroken to hear his story. Rick gave me one of Trevor's Purple Heart lapel pins to remember him by. It blew my mind that he gave this to me. I am truly honored. 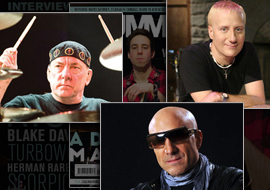 The current issue of Modern Drummer features "Essential Drummer Biographies" by Patrick Berkery. 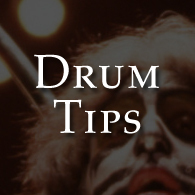 Included in the article featuring ten biographies every drummer should read is Makeup to Break Up by the one and only Catman, Peter Criss! They raised money all night so cancer patients can party every day. Peter Criss, a founding member of Kiss, and other celebs came to town to fight cancer in the Beauty Foundation for Cancer Care's 9th annual Beauty Ball, held Saturday, March 14 at the Robert J. Collins Arena on the campus of Brookdale Community College in Lincroft. Thank you to everyone who came out to see me at the Mad Monster Party! Thank you to Eben and his amazing staff and volunteers for making us feel welcome! Have a safe and happy Easter Sunday. I am very sad to hear that original Lynyrd Skynyrd drummer, Bob Burns, has passed away. It was a pleasure to know Bob coming up together in the 70's. We are very sad to hear that fellow drummer, AJ Pero of Twisted Sister, has passed away. Our thoughts and prayers are with his family and his bandmates at this very difficult time. His memory will live on in his family, friends, and fans around the world. Peter's appearance at Mad Monster! Have a happy and safe Valentine's Day with your sweetheart! May 2015 bring joy and happiness!